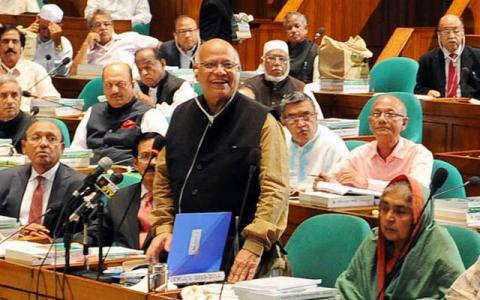 The Hon’ble Minister of Finance Mr. Abul Maal A Muhith has to be celebrated for the budgets he has given us. He and the government officers on the one hand mobilize such massive sums of money and simultaneously spends the same in 365 days. There is a consistent pipeline of projects and development is all round. Implementation is rigorously monitored through the weekly ECNEC Meetings which is without parallel anywhere. I would like to take the liberty to congratulate the government officers for keeping their heads down and doing the job. This is a result of our investment in education and social sectors leading to better quality of people who populate the workforce. The current capacity could very well be unsettling to many who would be happy with a ‘basket case’. We have to appreciate the Hon’ble Finance Minister for listening to every segment of the society and all interest groups. He is a believer in consultation. He is a polymath. His expectations of discourse on the budget is genuine. Limiting our discussions on handling of NPL only would be inadequate. We appreciate the context of external threats to stability. Surviving the global no holds barred protectionism after several decades of negotiated trade regimes is a matter of life and death for many states. Politics of large Project Loans, nuclear energy and politics, absurd annihilation of Rohingya - all impact what the Hon’ble Finance Minister has to deliver us. We have crossed six months of the 2018 and because processes are in place, implementation is going on and the “lame duck” syndrome does not appear to have kicked in. I would like to register our respect for the wisdom, determination and competence Hon’ble Finance Minister and the very learned and powerful team that work with him. The recent discourse by the Hon’ble Planning Minister, Information Minister and the Agriculture Minister adequately demonstrate the depth of understanding of the Budget, it’s imperative and challenges. Finall,y the Hon’ble Finance Minister dedicated his recent book “Economy of Bangladesh” to the “toiling peasants, factory labourers, and construction and transport workers, providers of various services and household workers of Bangladesh”. One cannot fault him or his government of not being concerned about the poor. We should celebrate him and not pillory him. As citizen and economic actors we have to strengthen their resolve and respond to the opportunities created for us. IGF 2013 Bali will go ahead!